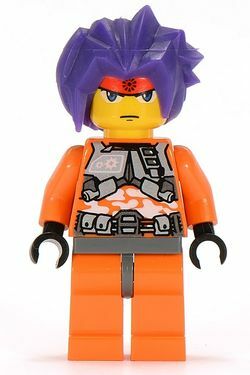 Ryo is an Exo-Force minifigure introduced in 2006. He is the pilot of the Uplink, the Mobile Defense Tank, the Cyclone Defender, and the Hybrid Rescue Tank. If anything needs fixing, Ryo is the one to do it. Before the first rebellion, Ryo was a master repair tech for a large factory on the northern slope. There is no circuit, no gear, and no weapon that Ryo cannot fix. After the robots rebelled, Ryo joined the design team that developed the Grand Titan. Ryo has 3 different orange coloured suits for each year. He has a turn around face one which bears a serious expression, the other bearing an angry expression. He has rubber purple spiky hair, the same as Takeshi, and Ha-Ya-To. His face has two sides, one looking normal, and the other in a mad expression. The Tank Gunner has the same suit as Ryo's 2006 variant. This page was last edited on 12 March 2016, at 12:09.